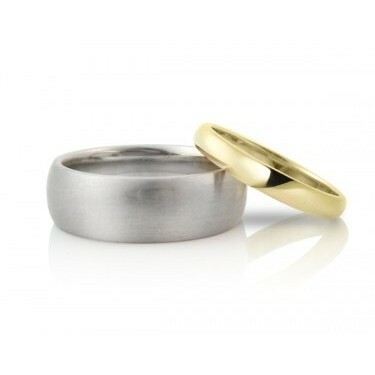 Your wedding rings are a sign of love, binding you together forever. These classic wedding bands are as simple as they come, durable, and very, very comfortable. Flat on the inside, and gently rounded on the top, they are a sign of your commitment to each other. To see other Classic Half-Round Wedding Bands, check out our Classic Narrow Wedding Bands and our Classic Medium-Width Wedding Bands. If you are looking for a wider wedding band or a Custom Wedding Band, please use the Contact Us Form to send us an email or make an appointment. You can personalize your wedding bands with an inscription inside the ring or leave it blank. Ideas for inscriptions include your initials, a date, a quote or a message understood only to you and your beloved.